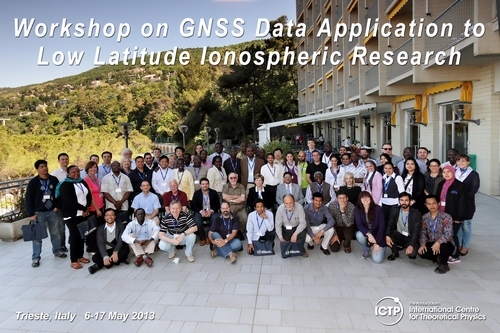 A Workshop on GNSS Data Application to Low Latitude Ionospheric Research, co-organized by Abdus Salam International Centre for Theoretical Physics (ICTP) and Boston College (BC) of the United States, was held from May 6 to May 17, 2013, in Trieste, Italy. Dr. Bai Weihua from National Space Science Center (NSSC), under Chinese Academy of Sciences was invited to attend the workshop after a highly competitive application process. Focusing on the ionospheric research in low latitude regions, the workshop was designed to provide participants with an in-depth view of scientific applications of GNSS technology. Formal lectures, hands-on practices, group discussion and presentation are encompassed in the ICTP workshop program. Participants were divided into several groups, with Dr. Bai Weihua from Laboratory of Space Environment Exploration, NSSC, assigned to the Asia Group. Their task assigned was to analyze the latitudinal variations of vTEC during perturbed geomagnetic conditions. ICTP is an international organization operating under the aegis of two United Nations Agencies, the United Nations Educational, Scientific and Cultural Organization (UNESCO) and the International Atomic Energy Agency (IAEA) with a seat agreement with the Italian Government that finances most of its activities. ICTP’s mission is to foster advanced studies and research, especially in developing countries. Their activities include theory and applications in all areas of the physical sciences.